Warner Carrillo, VP of Client Engagement at Imprezzio, is a leader that creates change, sets goals and develops solutions. Furthermore, he is a leader with one thing in mind: growth. “¿Quieres bailar esta noche? Vamos al noa, noa, noa,” is the tune Warner Carrillo reminisces about when the imagery of his childhood reappears. While it is unknown if Carrillo is much of a dancer, what is known is the Latino leaders’ knowledge of software industries and his experience in the insurance field. The entrepreneur began his career at Farmers Insurance, and during his 15 years with the company he held a variety of roles within the company. Carrillo first started off as a Property Claims Adjuster, then he moved on to become a Personal Lines Growth Consultant and he finished as the director for Sales Tools Strategy and Innovation. The impact Imprezzio had on Carrillo helped open a variety of opportunities for the leader and made him into one of the top industry experts. “Am I giving back enough?” is the biggest question I ask myself. Not just to the Hispanic community, but within my company, my business community, the city where I live, my mentors, my mentees and my family,” Carrillo said. 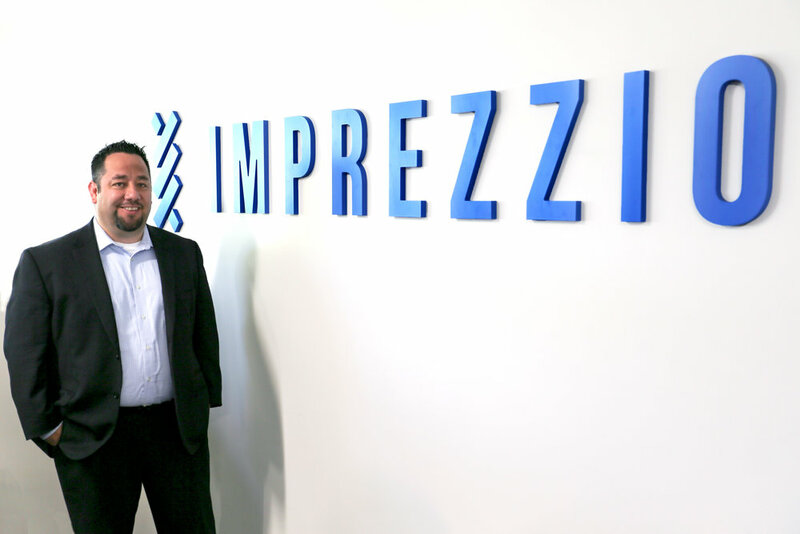 In August 2016, the Latino innovator joined Imprezzio Inc. as Vice President of Client Engagement. His lists of duties include a variety of tasks in connection to collaboration, customer solutions and setting goals within the company. “As a thought leader for our organization and in the Insuretech community, sharing knowledge on trends and best practices is key to driving Imprezzio client engagement,” Carrillo said. The rapid growth of technology and its connection to customer service is a key installment of the company’s innovation. Some of the benefits of working for an inclusive corporate like Imprezzio include: world-wide recognition, the presence of workers from all over and the continuous growth of the company. “Our organization is made stronger because we work with and employ people with unique, differing and diverse points of view,” Carrillo said. As Vice President of Imprezzio, Carrillo understands the values it par takes being a team member of a fast growing software industry. One key question Carrillo ponders when it comes to his own team is: Does a team member have the energy and motivation to help achieve the goals for the overall team? “I know who is going to work hard to help us achieve our goals, who I can count on for certain roles and how to get crucial projects completed,” Carrillo said. The entrust in his team members and value of leadership are just some things that have helped the Latino leader overcome obstacles and challenges throughout his time frame within the insurance industry. Whenever a difficult challenge approaches Carrillo sticks to his routine of: stepping outside, grabbing a drink and pondering how to handle the situation head on. “I’m surrounded by smart people who have different experiences and points of view and if I try to see an obstacle from their standpoint, it often becomes a great opportunity or a challenge that we can solve,” Carrillo said. Helping others and working hand in hand with one another has always been a concept the vice president stands by. One way Carrillo sticks to his concept is through mentorship. In the early part of his career Carrillo assisted in leading a mentorship program for the San Diego County Office of Education. One way the program helped him early on in his career, was by allowing the industry-expert to reflect on things in his life. Family is a huge part of Carrillo’s life and they continue to have an impact on the leader throughout his career. The Latino insider was born in California in a small town called Simi Valley. He is the middle child and only brother to two sisters. “I am first-generation, born in the U.S. and my parents emigrated from Guatemala,” Carrillo said. The values of hard work and perseverance taught early on helped the Guatemalan American get into college and become one of the top Latino innovators. “As a kid, I thought they were hard on me, but as a father now, I can appreciate what they did for us,” Carrillo said. In 1994, Carrillo enrolled into El Camino College in Torrance, California where his criminal justice journey began. After two years at El Camino, he transferred to San Diego State University. The most rewarding aspect of Carrillo’s career so far has not been his journey, but “the ability to see my fingerprint on the way that people do business,” Carrillo said.